DayBack brings your calendars together into a single view. 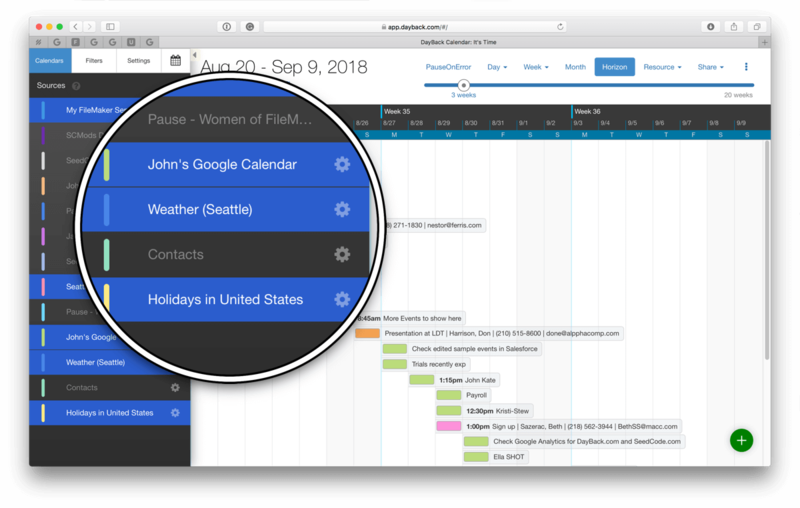 Some of these calendars come from different sources (like Salesforce or Google Calendar) and you'll see those in the left-hand sidebar under "Calendars". There you can turn their visibility off and change their colors. For Basecamp calendars, you'll see a list of your projects: one "calendar" per project. For Google Calendars, you'll see all the calendars that you own, have subscribed to, or that have been shared with you. When looking at FileMaker Server, you'll see any tables you've mapped in DayBack's settings: learn how to map FileMaker tables. When you're looking at Salesforce sources, you'll see your Tasks, Events, and Campaigns by default, and you can customize these mappings or add your own Salesforce objects to the calendar.